July 2012 - The recently released BASgatewayLX Modbus to BACnet Gateway has quickly become attractive to systems integrators because of its ease-of-use and the availability of several pre-defined energy meter device profiles for Veris, Northern Design and Continental Control Systems products. Adding Modbus devices to a BACnet system is no longer drudgery. Once the device profile is loaded, simply click off a check box and that Modbus point is added to the poll list. If we currently do not have the profile for your device we will develop it for you. Device profiles also exist for boilers and drives. To help systems integrators understand the flexibility of the product, we have expanded the data sheet to include tips on using the product along with several application examples. A key feature of the product is Virtual BACnet Routing were several Modbus devices connected in a bus are viewed by a BACnet client as a unique BACnet network. This allows a group of identical Modbus devices using the same device profile to have their points mapped to identical BACnet object instances without conflict. Each Modbus device in the bus is viewed as a unique BACnet object instance. 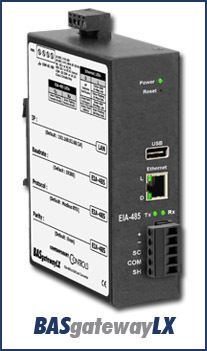 Modbus devices can be added, modified, copied or deleted using web page configuration. New device profiles can be downloaded from the Contemporary Controls' web site to the systems integrator's PC and then uploaded to the BASgatewayLX. The status of Modbus points can be viewed using a web browser. Up to 30 Modbus devices for a total of 1,000 Modbus points can be accommodated with one BASgatewayLX. Four application examples have been provided in the expanded data sheet. In the first example, two BASgatewayLX devices communicate with a BACnet client over Ethernet. Each gateway device creates a new BACnet virtual network consisting of a string of Modbus serial devices. In the second example, Modbus TCP servers and Modbus RTU slaves share the same virtual network – with TCP devices connected over Ethernet and RTU devices connect to a serial port. The third example shows that a Modbus TCP client can use the BASgatewayLX as a Modbus TCP router to Modbus RTU slaves with no configuration. Finally, the fourth example shows how to use foreign device registration in the BASgatewayLX to communicate to a BBMD located on another subnet. Regardless of the application, the BASgatewayLX is up to the task. You can access the new expanded data sheet from the BASgatewayLX product page.